Meghan Markle and Prince Harry's wedding cake is almost ready — see the prep work! Two hundred Amalfi lemons went into the lemon elderflower cake! A team of bakers has been putting the finishing touches on something sweet they plan to serve up Prince Harry and Meghan Markle on their big day! Kensington Palace released details Friday about the royal wedding cake being prepared for the reception that will follow Saturday’s wedding. 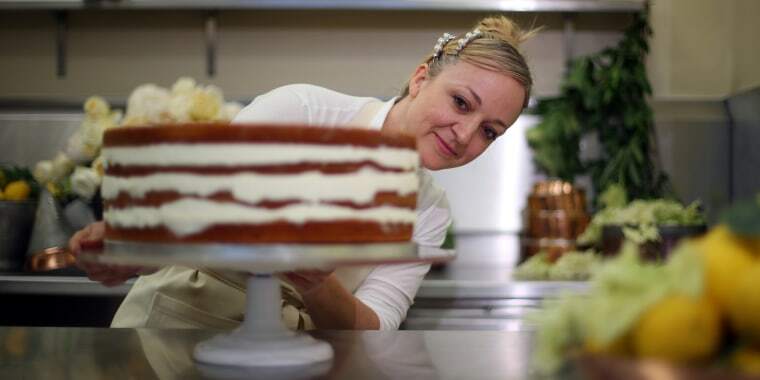 Images and a video released by the palace show American pastry chef Claire Ptak, who now runs a London-based bakery, hard at work on the cake inside the kitchen of Buckingham Palace. The creation will be a lemon sponge cake drizzled with elderflower syrup. It will feature an Amalfi lemon curd and will be covered with a Swiss merengue buttercream. "Where the buttercream is sweet, the lemon curd is very tart. So you get a really lovely thing happening when you take a bite, which is to get all of those flavors and sensations. Hopefully it’s perfectly balanced,” Ptak said in a video the palace posted on Twitter. The confectionary creation will use 200 Amalfi lemons, 500 organic eggs from Suffolk, 20 kgs of butter, 20 kgs of flour, 20 kgs of sugar, and 10 bottles of elderflower cordial from Sandringham, Queen Elizabeth’s vacation estate in Norfolk. Ptak is baking the cake inside Buckingham Palace's kitchen. The final product will then be taken to Windsor Castle, which will house two receptions following Saturday's noon ceremony at St. George's Chapel. "We will assemble it in-situ at Windsor Castle on Saturday morning. And then add the flowers, because they obviously need to be added at the last moment," Ptak said in the video.